Church Pulpit, Still Front and Center? There’s a certain weight to church furniture, both spiritually and quite literally. Through history the pastor alone led worship and the church furniture remained stationary, front and center. Now, with a great variety in worship styles, there may me a team of singers and readers, maybe a rock band with a full drum kit, or of course there still could just be the pastor. Traditionally the Baptismal Fonts, Communion Tables, Flower Stands, and the all important Pulpit that have long resided permanently in front of the congregation. Equally keeping in tradition, these church furniture chancel sets are substantial in size and cannot just be swept into a closet when the band begins to a drum solo in praise of Him. Casters, is that the answer? When you make the church furniture mobile, it can move to the left or right and make room for special church presentations. But, does that lessen the visual solidity that is sought in church furnishings? The concept of the “Centrality of the Word” is of great importance in Christianity and implies that the reading and preaching of the Bible is the centerpiece of a service of worship, and thus takes priority over the sacraments. The Central Pulpit is intended to give visual representation of this idea. In many Protestant churches, the pulpit is placed in the center of the platform, and is generally the largest piece of church furniture. This is to symbolize the proclamation of the Word of God as the central focus of the weekly service of worship. The pulpit may be smaller in more contemporary evangelical churches, and is generally carried out after the end of the song service. The term “From the pulpit” is often used metaphorically for something said with official church authority. 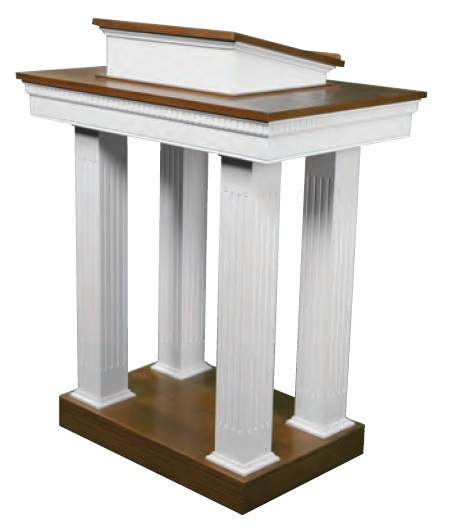 In churches where there is only one speaker’s stand in the center front of the church, it serves the functions of both lectern and pulpit and is properly called the ambo. The word ambo comes from a Greek word meaning an elevation. In the eighteenth century tiered pulpits were introduced in English speaking countries. The levels of these religious lecterns were intended to show the relative importance of the readings delivered to the church members. The bottom tier was for community announcements, the middle for the gospel, and the top tier was reserved for the delivery of the sermon. While church furniture and the placement of the pulpit are certainly not the strongest ties that bond people to their spirituality, it does matter. Church furniture and furnishings can influence your mood and have a visual significance on the expression of congregational worship. You wouldn’t want your church service to be shabby, out of date, and un-representational of your religious focus. What does your church’s pulpit say to you?